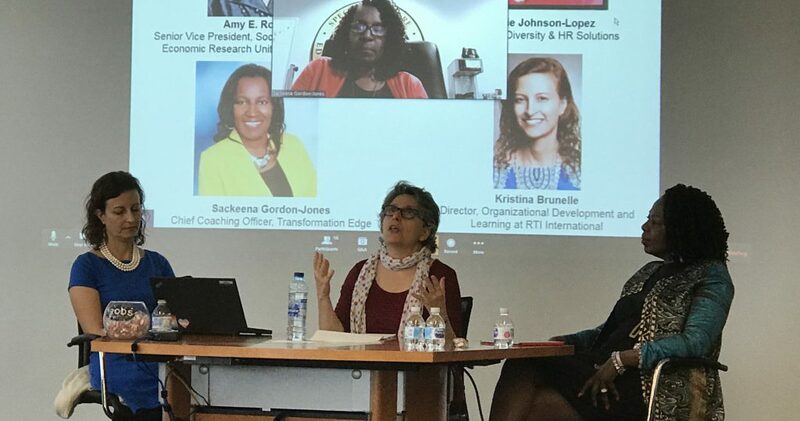 RTI’s Kristina Brunelle (left) moderates a panel discussion with Amy Roussel, RTI (center); Gracie Johnson-Lopez, Diversity and HR Solutions (right); and Sackeena Gordon-Jones, Transformation Edge and NC State University (on screen). Data science is hot. That’s good news for workers with data science skills. It also means organizations competing to hire data scientists need to understand how to recruit talent that will solve their data science challenges and contribute to creating a productive and diverse workforce. For many organizations, figuring out how to recruit and retain data scientists and fostering diversity among data science employees is a struggle, according to Kristina Brunelle of RTI International. Brunelle, director of organizational development and learning, moderated a panel discussion on data science hiring challenges on Thursday, May 24 at RENCI in Chapel Hill, NC. The discussion, sponsored by the South Big Data Hub, included panelists Amy Roussel, Senior Vice President, Social Policy, Health, and Economic Research unit, RTI; Sackeena Gordon-Jones, a human resources consultant and coach with Transformation Edge and an adjunct faculty member at North Carolina State University; and Gracie Johnson-Lopez, President and principal consultant with Diversity & HR Solutions. Most of the discussion focused on attracting and retaining a diverse data science workforce. Successful workforce diversity efforts don’t stop with hiring people of different ages, races, genders, and sexual orientations, according to Johnson-Lopez. They also understand the importance of making diverse workers feel valued and removing barriers that might impact them negatively. Employers must also consider equity and realize that all workers do not start their educations or careers with access to the same resources, and that many have had to struggle to overcome barriers. All three panelists agreed that to create a more diverse pool of data science job candidates, employers need to define what they are looking for, figure out where to look, and determine how to continue professional development once the best candidate is hired. Data scientists come with a wide range of backgrounds, said Roussel, noting that at RTI, many employees with a knack for working with data did not come from a traditional math, statistics, or computer science background. Develop internship programs with local colleges and universities, including Historically Black Colleges and Universities (HBCUs). Even better, start with high school students. These can open up long-term pipelines to diverse future workers. Partner with professional associations that serve underrepresented groups (e.g. the National Action Council for Minorities in Engineering) and post open positions with them. Include diverse people on interview teams, as well as people who will be the candidates’ work peers and customers. This diversity of backgrounds and viewpoints will give you a more accurate and well-rounded picture of the candidates. Look at the skills and expertise that your current data science team is lacking, as well as the customers who will use the products the team creates. This will help to ensure finding a candidate who is the best fit for the job. Sell your organization to your candidates. Explain your mission, brand, and value proposition so that they understand you and can determine if they want to be part of the organization. Have onboarding plans not only for the first day, week, or month, but the first year. Provide quarterly check-ins where new employees can talk about how they feel about their role and where they want to be in a few years. Provide lots of learning opportunities and employee resource groups that coalesce around interests and themes, such as women in data science, young software developers, etc. Educate your workforce on what it means to be a diverse and inclusive organization. Where is the organization strong? What might it need to do differently? Where can it improve? For those interested in learning more about issues related to diversity and inclusion, the 2018 Diversity & Inclusion Conference will be held August 9 at the Brier Creek Country Club in Raleigh, NC. The conference, titled Inclusive Excellence and the Urgency of Now, will include sessions on best practices for understanding bias in the hiring process, retention strategies, panel discussions (women, millennials and CEO), and a session aimed at driving inclusion in membership organizations. For more information and to register for the conference, check out the 2018 Diversity & Inclusion Conference website.